In 2014, southern parts of Sindh experienced a continuing dry spell that inevitably lead to a drought crisis. Tharparkar, where the community’s livelihood depends mainly on livestock management and seasonal farming activities, is one of the most affected districts in Sindh. Following the drought, a scarcity in food and livestock resulted in the death of 650 people. This was mainly due to the lack of drinking water and feed for farming animals. Hundreds of children are reported to be suffering from pneumonia and diarrhea which is constantly adding to the cases of acute malnutrition in the area. To overcome the alarming food security and nutrition requirements, Community World Service Asia initiated food assistance for drought affected families in the district from the month of February, 2015. In close coordination with local government authorities, nine villages and two bordering hamlets were identified in Taluka Chachro and Dahli of Tharparkar district. Twenty two village committees (VCs) are formed to promote coordination and assist in sharing information to ensure the full participation of communities in this project. Moreover, our teams were assisted by the VCs in selection of 1,800 households for food assistance, with a priority given to orphans, people with disabilities, widows, and female-headed households. Each family will receive a food package as per minimum Sphere standards consecutively for seven months. The duration of the response is designed in consideration of the immediate food needs and the harvesting time of seasonal crops. In Tharparkar, farmers usually begin to plant seeds after the forecasted rainfall in the month of June, which is projected to harvest after seventy days of planting. The affected communities are also expecting an increase in availability of drinking water for their livestock following the rain. 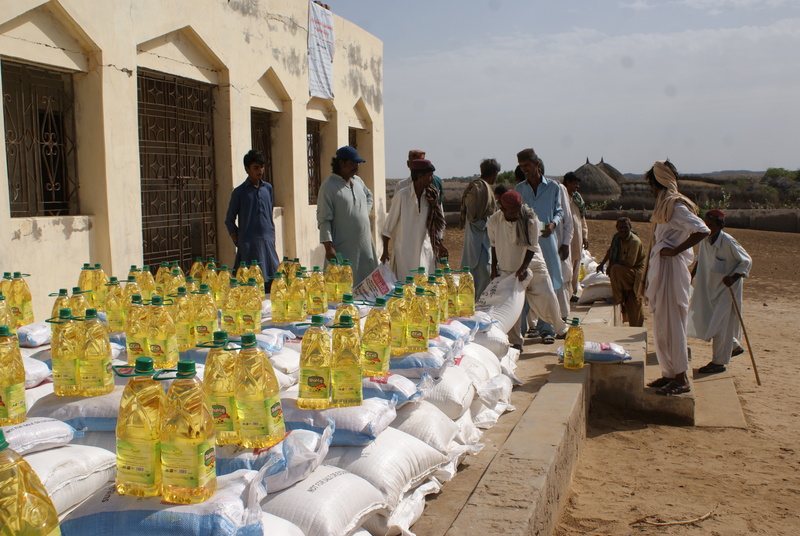 Two rounds of food distribution are completed since the commencement of the project until now. Our team on the ground is regularly coordinating with stakeholders by participating in cluster meetings, working groups and general coordination meetings. This is done to ensure the sharing of information, to learn from each other’s’ experiences and to avoid duplication. This assistance is possible with generous support from Canadian Foodgrains Bank and Presbyterian World Service & Development.